Cettie Pratt is an orphan living in the Fells, an area of starving, debt-enslaved, deed-contracted, ground-bound poor. Sera Fitzempress is royalty, living aloft in a luxurious castle floating in the air, in line for the throne; surrounded by luxury, she has never been allowed to leave her parents’ estate. The rich live aloft in floating manors that rise and fall according to the fortunes of their owners. The poor live below, ground down under the harsh conditions and work that support the nobles floating overhead. Everyone’s fortunes rise and fall as Cettie is taken in by a compassionate noble who wants to adopt her. Sera dreams of helping change society and demolishing the rigid codes that oppress the lower classes. Her father sees her as a rival for the throne, many nobles have no desire to change the status quo, and there are evil forces at work. Cettie is drawn to the Mysteries, even as Sera is drawn by her story. Can either girl break free of their assigned place in society and change the world around them? Storm Glass is reminiscent of a steampunk novel, but rather than mechanisms, there are magic stones, mysteries, and maritime vessels flung aloft. The world-building is wonderfully colorful and real, the characterizations are deep and complex, and the magical system of mysteries is, well, mysterious. Absolutely great story that I thoroughly enjoyed, just wish I didn’t have to wait for the next book. Storm Glass is a fun, enchanting read with a lot of deep thoughts. Highly recommended. Storm Glass is yet another excellent book by Jeff Wheeler. I highly recommend this book to anyone who enjoys a good fantasy novel written with the feel of a period piece that is complete with hopes and dreams that are both dashed and realized. There are ghosts, science, magic, intrigue, floating manors, power struggles, mysteries, and, of course, a few unexpected twists. 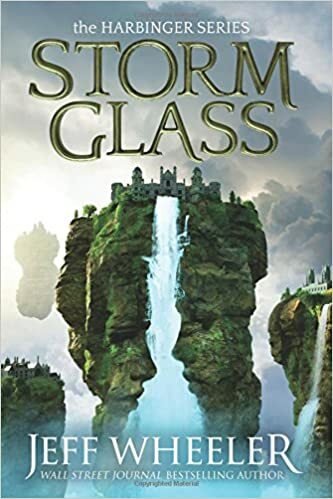 Storm Glass gets five stars from me because I felt immersed in the world and was able to relate to many of the characters on different levels. As both Cettie and Sera learn more about the world in which they live, my mind was racing—striving to make the same connections and understand the same mysteries that they were trying to understand. I felt keenly for the plight of both girls who, though they come from seemingly different worlds were both striving and yearning for freedom and knowledge. I enjoyed the differing perspectives and came up with many theories of my own as to why things happened the way that they did. Some were proven wrong, but as I read I felt a part of that world. As I neared the end of the book, I began to feel some tension (in a good way) that some of the issues wouldn’t be resolved by the end of the book. Knowing that it was going to be a five-book story arc, I worried that I would be left on a major cliffhanger. While I felt some things were resolved quite quickly at the very end, it was just enough resolution to create a sense of closure while leaving enough in the air (pun intended) that I can’t wait for the next book to come out. I found it a gripping story and I personally blame a good author for keeping me up too late at night when I should have been sleeping. I found the world a fun place to visit in my mind and contemplate its realities. I felt that virtually all of the characters were engaging and relatable in some way. While dealing with some heavier social issues that the protagonists were faced with, I still found it a fun read that kept my mind engaged as I tried to unravel some of the mysteries myself. At times I felt that if I could just figure some of the mysteries out, that it would somehow enable me to reach through the pages and help our protagonists. I commend Jeff Wheeler for another well written story that is different enough from his other books that it feels new and fresh, while maintaining a few familiar elements that connect his worlds. He masterfully unfolds new adventures through the eyes of two different protagonists while throwing in enough unexpected twists that make things come together in exciting ways. I highly recommend this book to anyone looking to explore a new world with relatable characters, a touch of magic, and engaging mysteries. First of all, I received a free copy of this book in exchange for an honest review. That said, please know that I will be as open as I possibly can in my review. Good, bad or ugly. For those of you who, like me, have read literally everything this author has ever written, this series is a bit of a departure from his normal style. While not entirely in the steampunk category, it certainly has its classic components. Also, rather than engaging you in a single main character, this story is rather divided into two main characters. It’s clear their lives are set on a course that will intersect at some point, or at least impact each other, but in the opening portions of this book they are quite separate. For me, it was a bit harder to fully identify with them for that reason. I felt as if there was a lot of build up early on. Also, the hardships faced were so oppressive, so daunting and sometimes impossible that I felt almost hopeless, a feeling I tend to distance myself from, so I felt as if I were almost holding the characters at arms length rather than embracing them. And then it happened. In a masterful way that was almost more powerful for all its lengthened anticipation and oppressive conflict, the tides began to turn. Suddenly I was flooded with all of the emotion, power, joy, empathy and excitement I’d been waiting for. Piled on top of that were some connections to other works by the author, which brought not just this book, but the entire writing / reading career full circle. Was it worth it? Was going through the higher than normal levels of angst worth it by the time I was done? Overwhelmingly, yes. Worth it and more. I can hardly stand the wait to read the rest of the books in this series. There are still a lot of things waiting to come together, and I’m sure there will be more conflict to make me bite my nails off and stay up until 4am reading, but in the end I feel as if Mr. Wheeler has come to some new level of his writing. Like a Samurai, he’s wielded his sword (pen) in a new way, which while a bit intimidating, was also masterful in its power.